By the end of the eighteenth century the Commissioners of the Crown had become interested in the enclosure of Eton's commons and Lammas lands. All over the country enclosure was taking place and there was much publicity for its advantages. According to their estimate the land needing to be dealt with in Eton comprised three-quarters of the parish. Little, however, seems to have been done until John Penn, Lord of the Manor of Stoke Poges as well as Eton, began making plans to push an Inclosure Bill through Parliament. He had already succeeded in Stoke Poges against considerable opposition, particularly over the enclosure of Stoke Common which furnished turf and furze, used as fuel by many poor families as well as the workhouse and the Hastings Hospital. In the end a compromise had to be reached, and perhaps because of this the Eton Inclosure Bill specifically excluded the Great Common. However, even this concession was not sufficient to ensure the smooth passage of the Eton Inclosure Bill through Parliament, for John Penn made the tactical error of not consulting the Crown or giving them opportunity to appoint their own Inclosure Surveyor. The particular problem in Eton was the proximity of Manor and Saddocks Farms. Not without considerable ingenuity could the different plots of land be rearranged so that, as well as each farm receiving its fair share, the share formed a compact block adjacent to the farmhouse. When at last the Officers of the Crown became aware of Penn's plans it was too late to do anything except oppose the Bill. This was not only a battle between landowners; townsfolk and villagers were worried about the likelihood of their loss of rights and did the only thing open to them - they presented a petition to Parliament. They protested that 'the Bill instead of producing any beneficial effects (would) tend to diminish the comforts and prosperity of the Inhabitants by depriving them of the Right of depasturing their cattle on the Lammas lands, thereby increasing the Poor Rates, the burden of which is already quite as much as can be borne'. Over one hundred and eighty people signed the petition or made their mark if they could not write, and amongst them several who almost certainly came from Eton Wick like Joseph and Phillip Tarrent, John Atkins and Tholpas Goddard. Other parishes had presented petitions, but often in vain, for Parliament mostly comprised landed gentry who tended to think in terms of protecting their own interests. As tithe-owners the Provost and Fellows of Eton College had originally been as interested as John Penn in the proposed Bill, but it seems possible that at the last moment they changed sides. Perhaps their loyalty to the Crown was called into question; they were after all considerable leaseholders from the Crown. They had the power to sway the balance in Parliament by influencing the Members of Parliament, many of whom were old Etonians. This however is speculation, and we shall never know the full story, for the records were lost when the Houses of Parliament were burnt down. The Bill was defeated on 1st May, 1826: the town and village celebrated with bonfires and testing in the local inns. 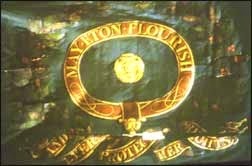 A banner was painted on blue silk for the occasion and paraded triumphantly through the streets proclaiming the sentiment that was to burn brightly for another century or more, 'May Eton flourish free and ever protect her rights'. No other Bill for the enclosure of Eton was ever presented to Parliament. The people of the parish continued to be vigilant in preserving their rights, even to the extent of taking a man to court about 1840 for building two houses on part of South Field near the village. It was his own land; yet when the case was tried at Aylesbury he was ordered to pull them down because they were built on Lammas land. When in the middle of the nineteenth century the Crown once more became interested in enclosure, the College was opposed to it and the Penn estates were 'in circumstances that render(ed) it difficult to be dealt with'. Not until 1902 did the Crown successfully negotiate with the Lord of the Manor to overcome the inconvenience of the scattered strips, and even the the pasturage rights, or Lammas rights, were not extinguished, but only an exchange effected. The rights still exist though most people lost theirs through the Commons Registration Act of 1965. To some people the rights have become an inconvenient anachronism, while to the majority it is just something that has nothing to do with them. Yet it is these rights that have preserved Eton Wick as a village and prevented it from becoming engulfed in a suburban sprawl.